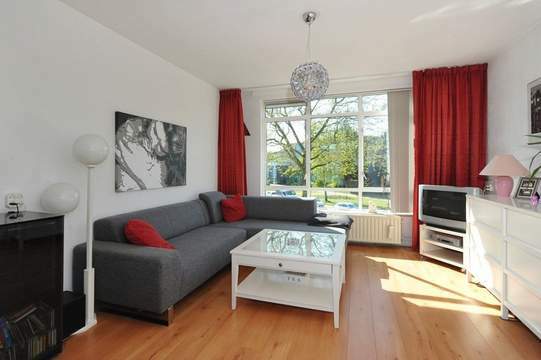 A bright top floor fully furnished two bedroom apartment with balcony on the second. Shops, restaurants and public transport are within walking distance (bus number 45 stops in front of the apartment that goes Station Laan van NOI). The property is close to highways (A4, A12 and A13). Outside stairs to the first floor. Private entrance. Inside stairs to the second floor. The hall provides access to all rooms. From the hall access to the bright and spacious living and dining room with access to the balcony at the back. Separate kitchen with fridge / freezer, dishwasher, microwave, oven, hob (gas) and hood. From the hallway access to the first bedroom at the front with double bed. At the back is the second bedroom. The bathroom has a shower, sink, washing machine and dryer. - The apartment is available for up to 2 people,.